London South Bank University (LSBU) Film Practice Lecturer Meloni Poole has been recognised with a Best Directing award for her anti-bullying short film TRiGGA. Meloni was awarded the title at the Women’s Independent Film Festival, which is the most recent of a long list of prestigious festivals which selected her 16-minute short for screening. 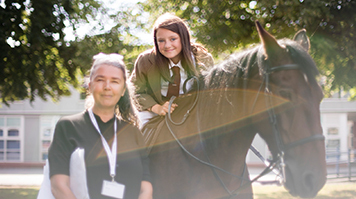 Based on events from Meloni’s childhood growing up in Sheffield, TRiGGA was filmed in the ex-coalfield town of Sutton-in-Ashfield and follows Mae as she confronts her bullies with the help of her horse. The film has been screened at a number of well-respected festivals around the world, including the BAFTA-qualifying festival Aesthetica, London Short Film Festival, Toronto International Film Festival (TIFF) – KIDS and will screen at Hamburg International Film Festival and Busan International Youth and Children’s Film Festival later this year. TRiGGA was warmly received in Toronto, where Meloni took part in a podcast on developing cinema for children, and not shying away from working with animals and children, as is typically discouraged. “TIFF KIDS is the largest children’s film festival in the world and there were 800 children visiting every day, who were very passionate about the film and were very engaged with the issues in TRiGGA,” Meloni said.